Did this painting as a gift for my cousins. They have an abundant container garden in their backyard in NY so I attempted to get the feeling of the energy of all the wild bright colors that show up each spring and summer. Decided to do another version of the Hydrangeas and Stock arrangement while the flowers were still in pretty good condition. 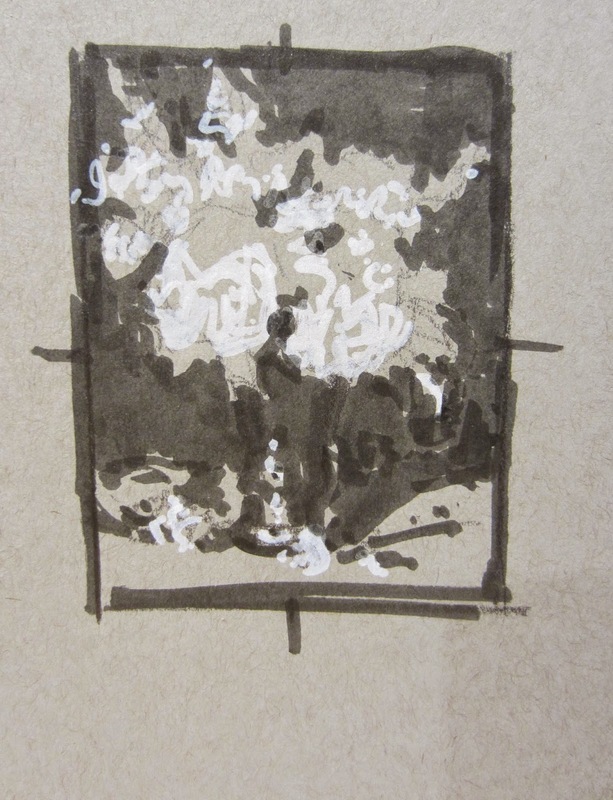 This time I envisioned a dark background as indicated in the value sketch below. Set up the still life with the darker background pictured below. Flowers were half gone by the next afternoon, so glad I took some photo's. 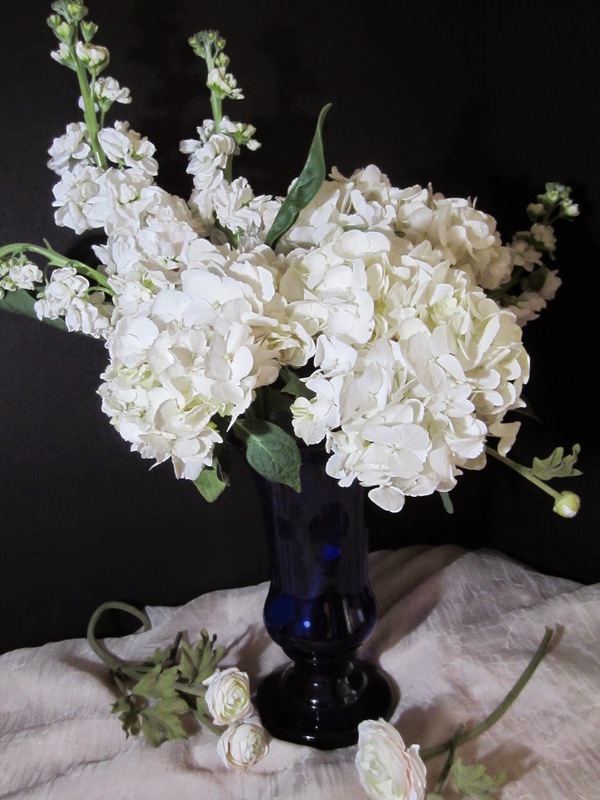 Flowers on the tabletop are some silk "stand-ins" I keep in the studio to fill in as needed. I recently found this beautiful blue glass vase at a local consignment shop. Wanted to contrast it with some white flowers, so found both hydrangea and stock at my local Whole Foods. Set them up in this arrangement. Added a few silk flowers I keep in my studio on the tabletop. A little taste of the season. 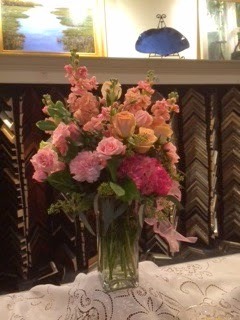 Saw this lovely bouquet at Frameworks Gallery's 40th anniversary celebration a few weeks back and took a photo on my phone. Not the best of lighting, or ideal setting, but tried to distill what I had to capture the simple beauty of the bouquet without a lot of extraneous detail. In honor of 2014 marking my 20th year of painting, I am having a special thank you anniversary sale on Saturday Dec 6, 1-5pm at my studio in Atlanta. If you are in the area and would like to attend please contact me with your email address and I'll send the details. For those of you who are not in the Atlanta area or are not available on Saturday I am extending the sale on-line from 5pm Friday 12/5 thru 5pm Saturday 12/6. 20% off all available oils and 50% off all available watercolors. To see a broad selection of what may be available visit my Daily Paintworks gallery. I had done a small painting of this grouping of flowers a few years ago, but recently came upon the original photo again and couldn't resist revisiting this inspiration. 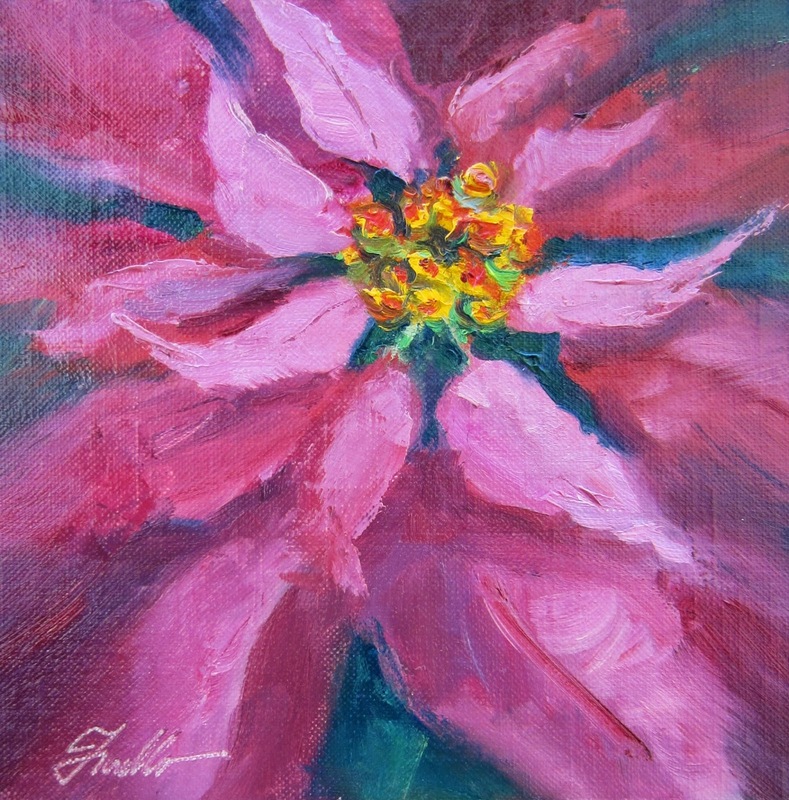 This time did a 12 x 16 and emphasized more of the feeling of these flowers emerging from the garden. One of the things I've been working on is integrating more grey tones in my paintings. I'm mixing up a large batch of grey before I start painting and then include it in my shadows and other places where I want to tone down the vibrancy so I can emphasize the vibrant colors in other areas by contrast. I recently did a study of greys pictured below. I took 5 differnt grey combinations( mostly complementary pairs) and then mixed a bit with white, and made a slightly warmer and slightly cooler version then mixed those families of grey with 29 other colors on my palette and then added white to each one. I haven't calculated how many greyed colors those amount to- but it felt like a lot while doing this study. It's on and 18 x 24 canvas panel to give you an idea. I have it out in my studio and before I et started painting I look to see if there's a particular grey combination that seems best suited to the overall color harmony of my scenes and then prepare some of that before I get going. Since working with more greys is a new habit for me, I'm being intentional about being prepared ahead of time so I don't fall back into old ways. I find as I am exploring new directions in painting , I can focus on making one ore 2 changes at at time and integrating those into my process. Will keep you posted on my learnings in this area. A few simple roses gently lying on a tabletop- sometimes a nice change from a more formal arrangement in a vase. Soft, tender, warm- that is how this felt to me. 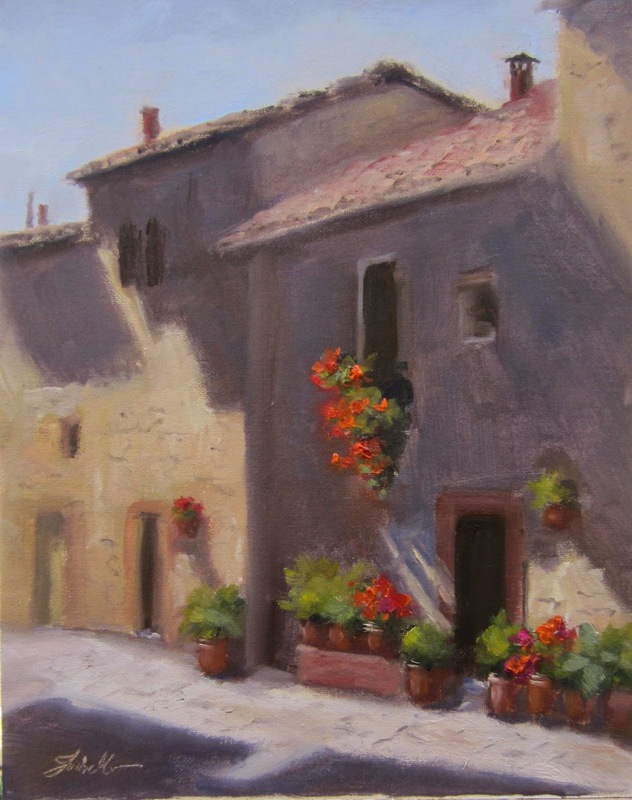 If you follow my work, you know I have painted many scenes from Pienza, Italy. The town is charming. A wonderful place to spend a day (or a month!). But what I find so captivating is the sunlight. There are so many beautiful dramatic shadows on the buildings and in little small garden spots. I am always searching out the light for beautiful patterns. Here's an example of taking multiple reference photo's to create a scene. Below are 4 different photo's I used to develop this painting as well as a little thumbnail sketch. Here's where artistic license comes in. 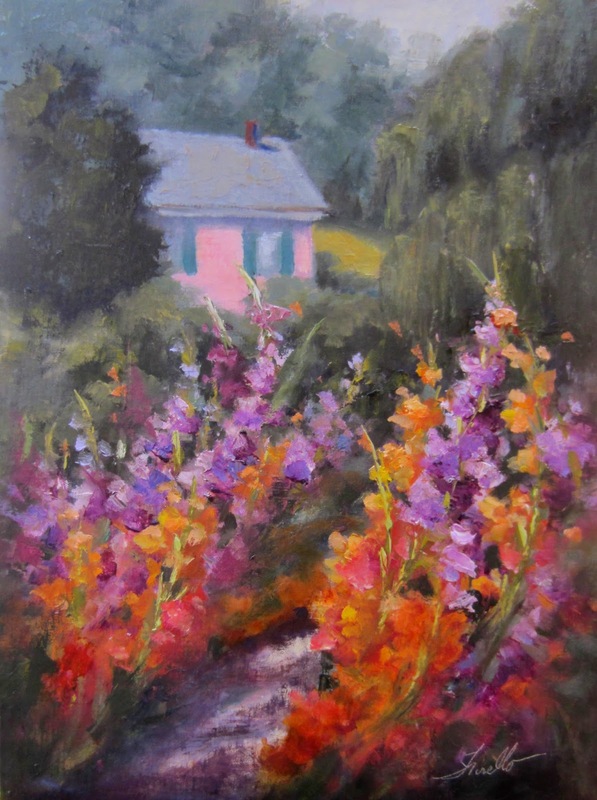 I loved the lush and colorful gladiolus but wanted a bit of Monet's house in the background to give a sense of place. So I used a bit of the house from another photo and a weeping willow from a different photo. Also liked the idea of a path to lead you in. That is very characteristic of that garden. Lots of narrow paths surrounded by an abundance of colorful flowers. If you've ever dreamt of seeing Monet's Garden, I have an opportunity for you to join me for a very special opportunity to paint there on location June 4-11, 2015. For more information, see: this flyer or website for additional information and how to register. Feel free to contact me if you have any questions. Space is limited to 8 participants, but there are still a few spots available. This may look familiar. I did a painting of this scene a couple of weeks back. I decided to do another version really emphasizing what I loved most about this scene. 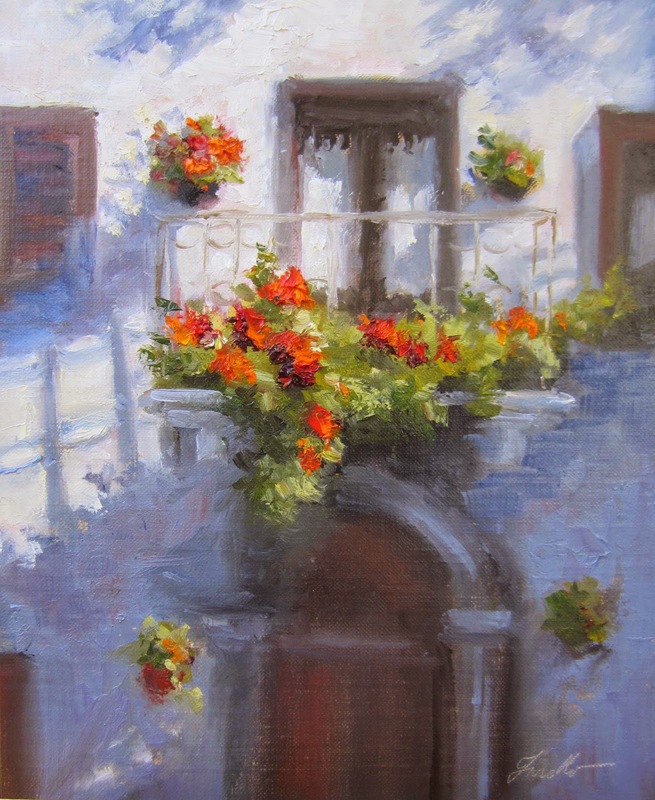 I cropped the view in even further, added more flowers and upped the color intensity, played down the doors and accentuated the edges of the shadows of the balcony. While I liked the first version (below) which was pretty faithful to the photo, I think version II is a stronger design and says more about what initially grabbed me about the scene. I'm a big proponent of revisiting a subject over and over to push your vision of it further. There is always something to be learned. 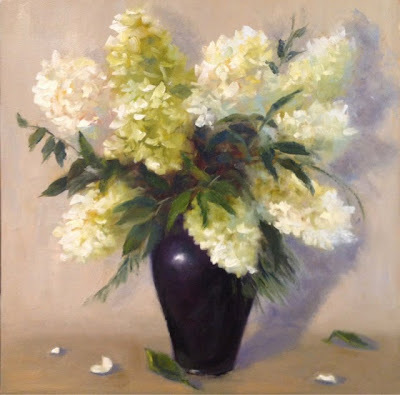 Small study of fall hydrangeas with a little more muted palette than typical summer flowers. 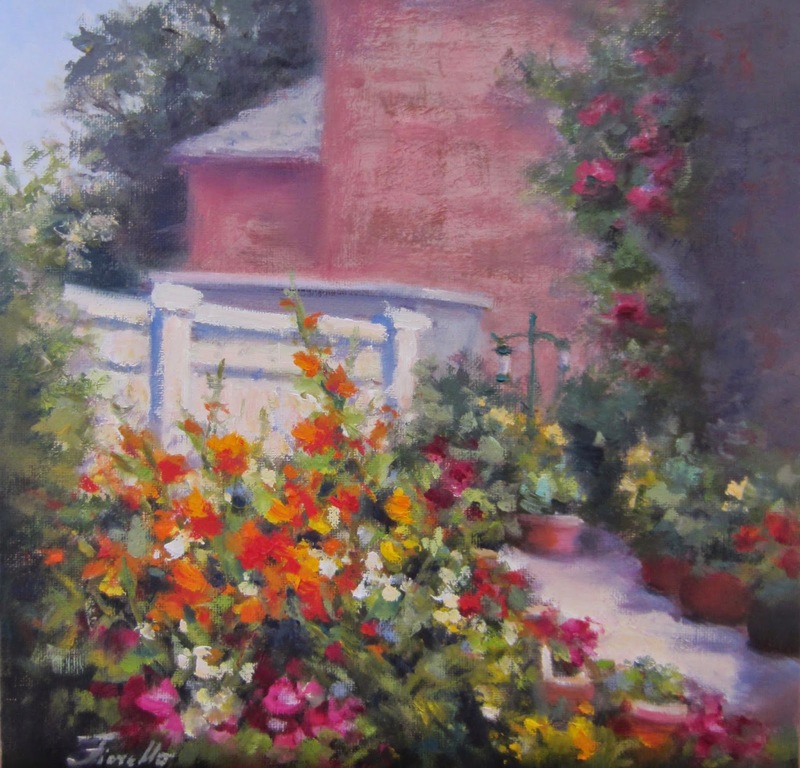 Looking forward to returning to Monet's Garden in Giverny, France to teach a painting workshop June, 2015. 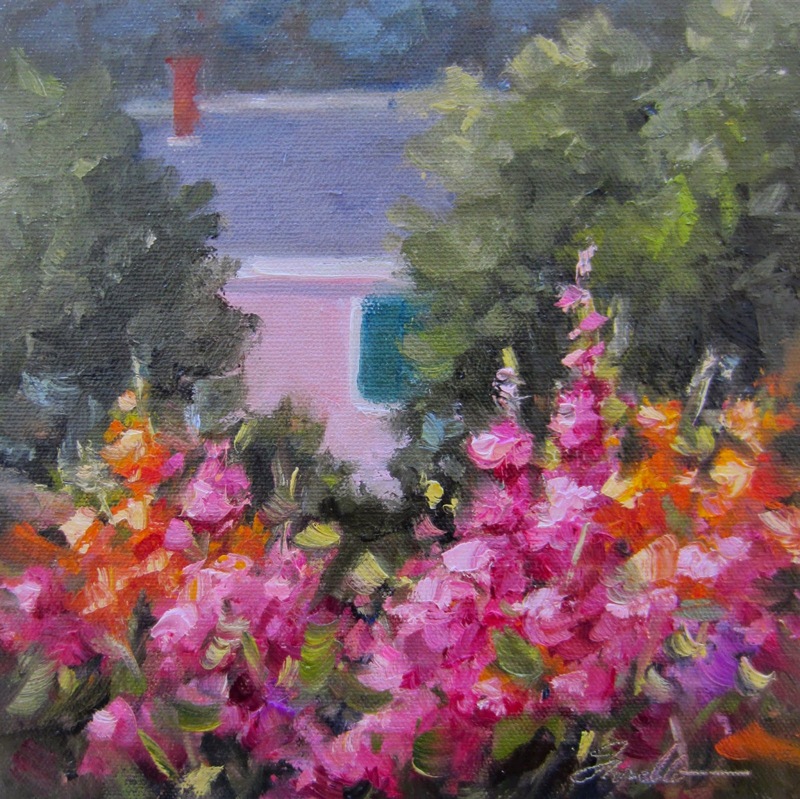 This is a small study of some of the vivid flowers in the garden with Monet's home in the background. There is still space available if you'd like to join me for the painting experience of a lifetime. We'll be painting the landscape around Giverny and visit Monet's Garden each day to paint after the tourists are gone so you can paint, photograph and enjoy the gardens without distraction. 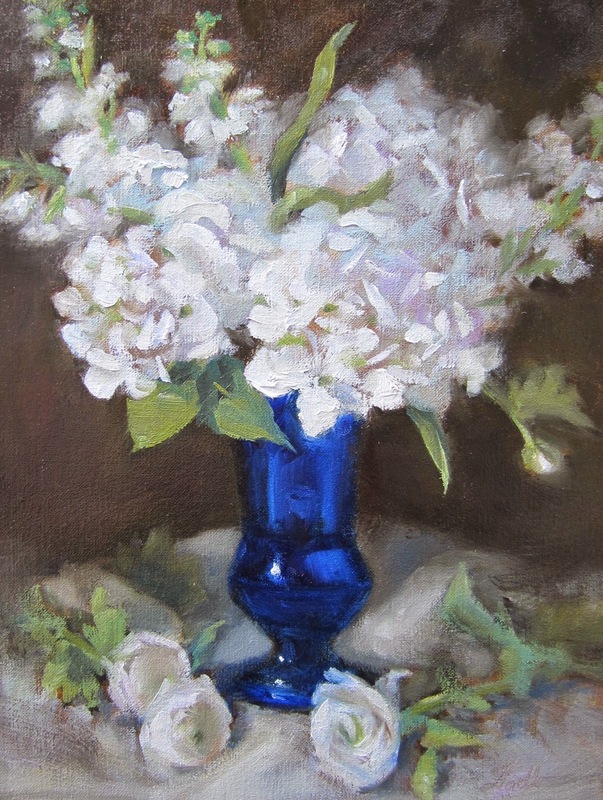 For more information, see http://www.artcolonygiverny.com/ or a flyer on my website. Feel free to contact me if any questions or if you would like to register. 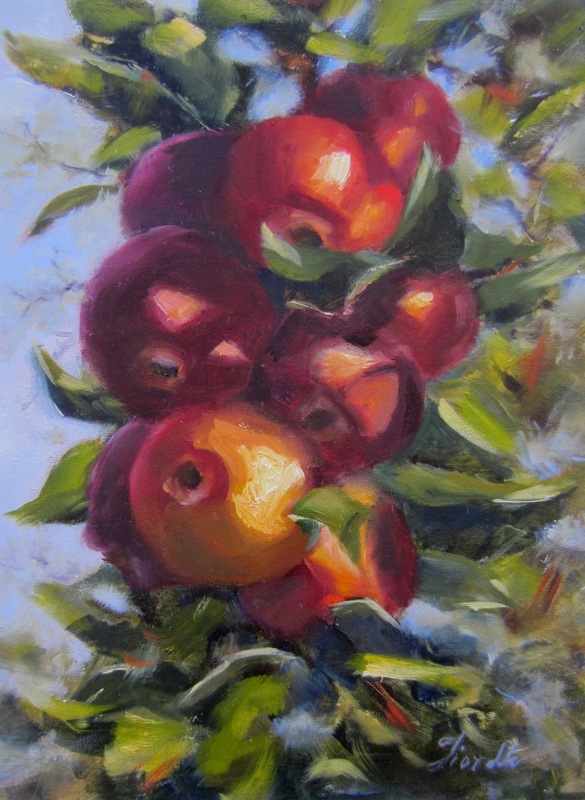 You might think this painting of apples is a bit of a different subject from my usual landscapes and florals, but not really. The subject I'm currently focused on is sunlight. I caught a glimpse of this beautifully sunlit fruit during my recent trip to Italy. 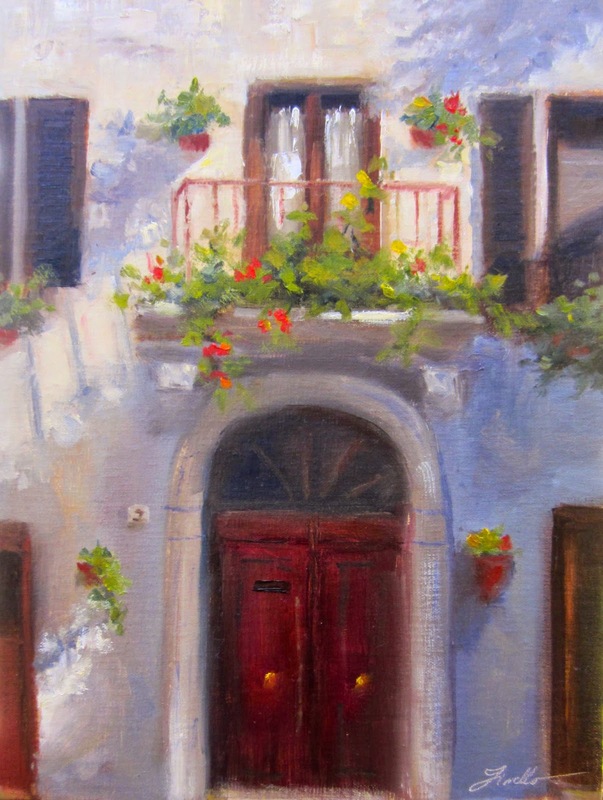 "Bella Italia, Italy Through the Eyes of an Artist"
FREE Shipping anywhere in the U.S. during the month of November. To help kick off the holiday season, I'm offering free shipping on orders for my book, "Bella Italia, Italy Through the Eyes of an Artist" anytime from November 1 through November 30. If you're looking for something different for friends or family members who love Italy, art or both, this may be a gift they will truly enjoy relaxing with and remembering good times traveling through Italy. 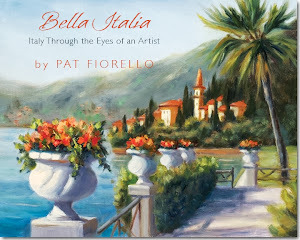 The book contains over 80 of my paintings of Italy from Tuscany to Lake Como to Venice and many beautiful small towns in between. I'll be happy to autograph and inscribe the book for you (just let me know who to address it to when you order). More information about the book, including a sneak peek preview, is available at :my website. But be sure to use this special Buy Now button during the month of November to avoid shipping costs. P.S. If you accidentally click the regular button which includes shipping, don't worry I'll rebate the shipping costs to you. A second in the series about sunlight. This scene was in Pienza, Italy. I was attracted by the sunlight on the plants and the patterns of light and shadow created by the distinctive architecture. I've culled down over 1300 photo's from my recent trip to Italy and I've selected some favorites to begin a new series. Probably no surprise, I love scenes that depict light and shadow and love plants with flowers that add a pop of color agains all the neutral stonework typical in Italian architecture. This scene is from a charming little town Pienza. 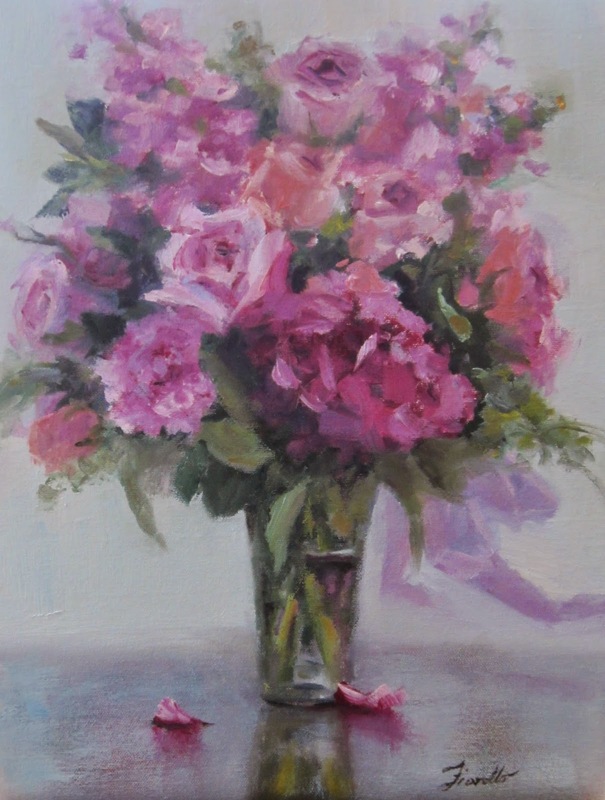 Latest oil painting,fresh off the easel. Saturday was my first day back in the studio after my 2 weeks in Italy. 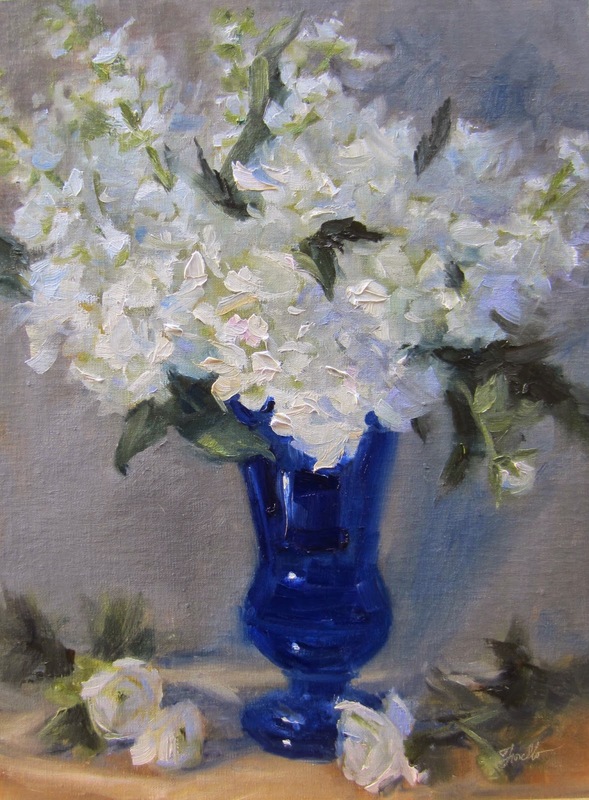 Had left a photo of these flowers (set up outdoors while on a past trip to France) on my easel as the first inspiration for when I got back. Put on some finishing touches today. Ready to get on to painting some of the new inspiration from Italy soon. Why do so many people dream of traveling to Italy? In fact, with over 47 million visitors in 2013 Italy was ranked one of the top 5 in world tourist rankings by the United Nations World Tourism Organization (UNWTO) as part of their World Tourism Barometer publication. And this fascination with Italy is not new. From about 1660’s thru 1840, Italy was part of a traditional trip in Europe called the Grand Tour. It was an educational rite of passage for nobility and the wealthy to visit Italy to expand their horizons in terms of art, culture and the roots of Western civilization. And many artists, including John Singer Sargeant and others, dating back to Corot, have made Italy a destination for extended painting excursions. the enjoyment of Italian art, food and culture. Beyond being the inspirational birthplace of the Renaissance, there’s something about the beauty of the landscape that is compelling and enduring when it comes to art. In preparing to teach my first workshop in Tuscany, I pondered the question of why Italy has had such an attraction for artists for centuries through the perspective of art. I observed that Italy naturally possesses many of the aspects of well-designed art. Its beauty is inescapable. From the enchanting and elegant lakes in the north to the lush agrarian beauty of Tuscany, to the breathtaking Cliffside towns on the Amalfi Coast, beauty is all around. There are many contrasts in textures and natural color harmonies as the old stone buildings came from the earth so they perfectly complement the landscape that surrounds them. 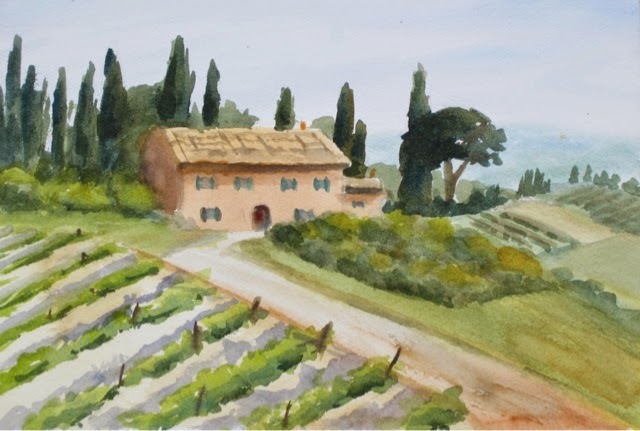 There are powerful diagonals in the landscape, for example in Tuscany with the rolling hills and vineyards that create a dynamic composition so they eyes to enjoy. And there is the story telling power of centuries old buildings that have character. One can only imagine what life was like in those towns 100, 500 or 1000 years ago. 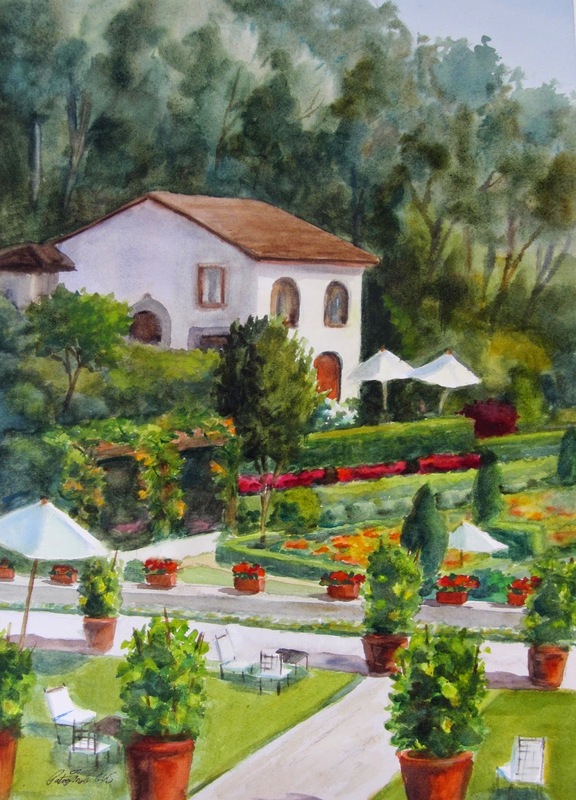 So viewed through the eyes of an artist, it is easy to see why Italy holds such a unique appeal. 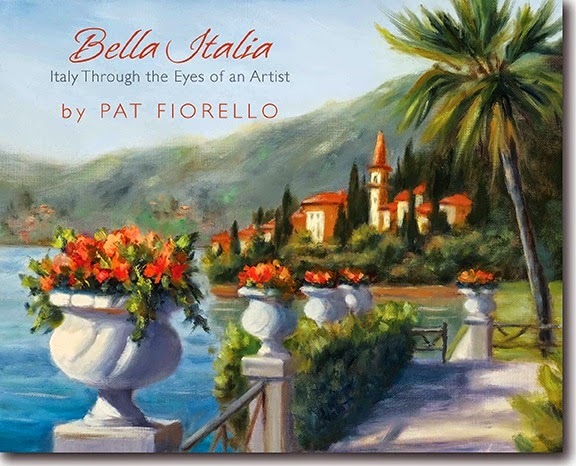 I go further to explore and share the beauty and magic of Italy in my book, “Bella Italia, Italy Through the Eyes of an Artist”. It’s a visual tour of Italy through over 80 of my paintings. For more information, please see: http://patfiorello.com/bella-italia. The book is meant to celebrate the beauty of Italy. If you have been there, it is sure to bring back warm memories. And if you haven’t visited yet it will surely have you be dreaming of Italy! And just maybe booking that next trip! 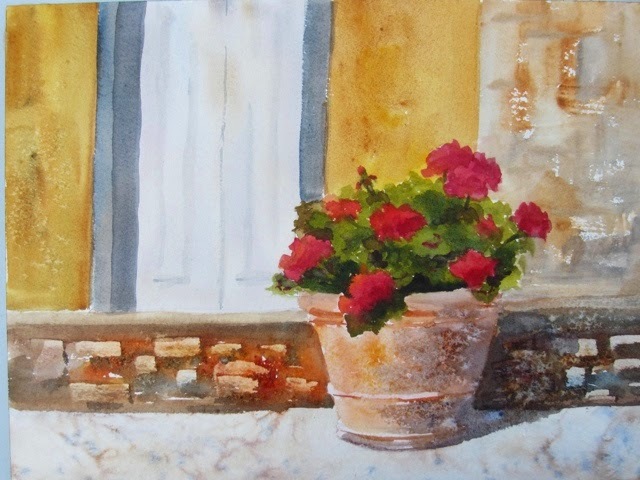 A "paint along" demo for my students in Tuscany showing techniques for painting flowers and suggesting texture in watercolor. This is the second of the pair of paintings recently commissioned by a client. 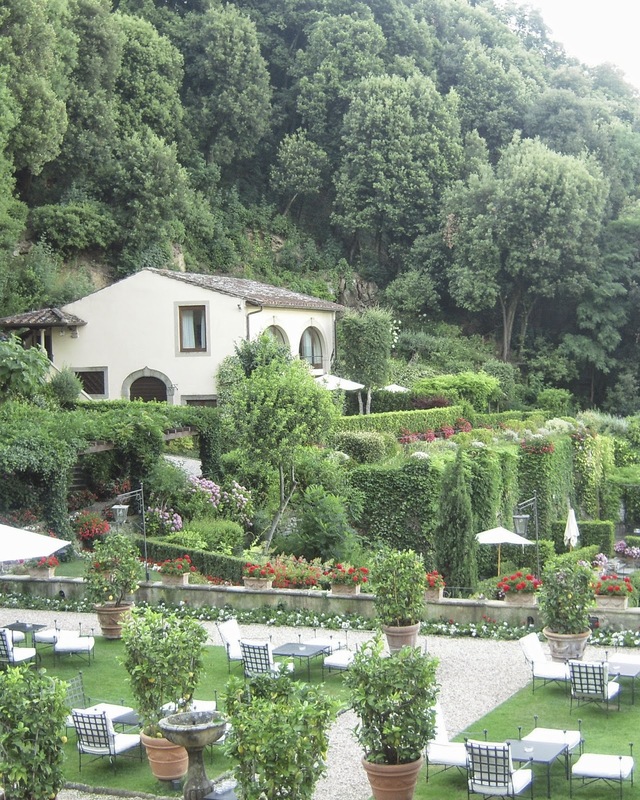 She originally had taken an horizontal picture of this favorite resort she stayed at in Florence, Italy. I could tell by the way she talked about this place that she really had such warm memories of being there. So with a little cropping I was able to translate it into the vertical format she needed to fit on her wall space and be consistent with the other painting. Again, took some artistic license to move a few things around, make it a sunnier day, simplify and emphasize some colors that were in the other painting so the palettes would harmonize. Also brought more variety to the greens. cooler in the distance, warmer up close so there wasn't so much of the same green as in the photos. If you'd like memories of one of your favorite places turned into a painting you can enjoy each day or for a special gift, please contact me for a complimentary design session- either in person or via phone. Roses from my garden. A new addition to the garden this year, a small David Austin rose bush. I invite you to visit DailyPaint Works to see more of my paintings.